Tunstall is an area in the City of Stoke-on-Trent, Staffordshire. It was one of the original six towns that federated to form the City. 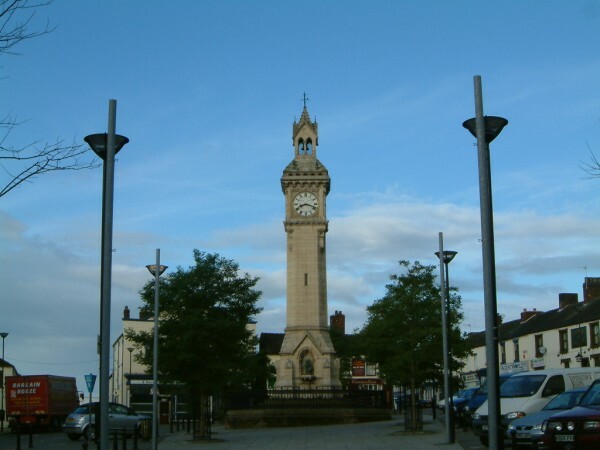 Tunstall is the most northern, and fourth largest town of the Potteries and is situated in the very north west of the Borough, with its north and west boundaries being the city limit. It stands on a ridge of land between Fowlea Brook to the west and Scotia Brook to the east, surrounded by old tile making and brick making sites, some of which date back to the Middle Ages. Tunstall's industries were served by the Trent and Mersey Canal, constructed over 11 years from 1766. The canal was designed by James Brindley, resident of Turnhurst Hall in nearby Chell. 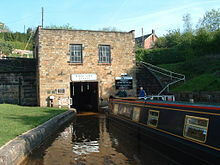 Just north of Tunstall lies one of Brindley's greatest achievements, the Harecastle tunnel, which takes the Trent and Mersey Canal underneath Goldenhill. Barges were 'legged' through by men lying on their backs on top of the barges and pushing against the roof with their feet. This was a physically demanding and slow, causing major delays, so in 1827 leading civil engineer Thomas Telford was commissioned to provide a second, and wider, parallel tunnel with a towpath. Today the Harecastle Tunnels are the fourth longest canal tunnels in the UK. Tunstall was served by a railway station, which was opened by the North Staffordshire Railway on 1 December 1873. This closed under the Beeching Axe in 1965 with the removal of the Potteries Loop Line. Today Tunstall lies roughly equidistant between Longport and Kidsgrove railway stations on the Stafford to Manchester Line, a branch of the West Coast Main Line (Network Rail Route 18). There are also direct services to Crewe and Derby. It is also well served by buses provided by: Baker Coaches, Clowes Coaches, D&G Coaches, Wardle Transport and First Potteries, connecting Tunstall to all surrounding settlements. The A50 is the main arterial route through Tunstall, running from Warrington to Leicester via Stoke and Derby. Tunstall is linked to the A500 "D-road", which passes just west of the town, by the new A527 linkway the town connecting Tunstall and the rest of Stoke-on-Trent to the M6 motorway. Slightly further east the A34 runs north-south, towards Manchester and Newcastle-under-Lyme respectively. There is evidence of small scale pottery manufacturing in Tunstall from the 14th century. However, Tunstall was one of the last of towns in the Potteries to begin large scale pottery manufacturing, with the main focus being on farming, and to a lesser extent, coal & iron mining and mills. Thus Tunstall was not affected by the 1842 Pottery Riots. However, Tunstall still has a rich industrial heritage. At the start of the 19th century there were 3 pottery works in the town, by the close of the century that number had risen to 13. Famous potters located in the town have been the Adams dynasty of potters founded by William Adams, as well as Alfred Meakin, Booths founded by Enoch Booth, and Enoch Wedgwood. Robert Beswick, father of Beswick Pottery founder James Wright Beswick, began making pottery in Tunstall. Jabez Vodrey is a noted emigrant potter, the first English potter west of the Appalachian Mountains. Clarice Cliff (20 January 1899 - 23 October 1972) was an English ceramic industrial artist active from 1922 to 1963. Charles Shaw was a 19th century potter who's in-depth autobiography has given some of the clearest insights into the Victorian Potteries, and provided Arnold Bennett with inspiration for his Clayhanger novels. Tunstall became widely known for its tiles, regarded to be as good as slate. Decorative ceramic tiles are still made in Tunstall by H and R Johnson-Richards Tiles Ltd.